The Most Popular Size Of Vertical Holders. This page include several most popular sizes of vertical and top loading holders for name badges and IDs. They come with clear front and clear back. The holder - BH-7711 come with zip lock on the top to secure your name badge or ID card from falling down and give extra protection of rain drops. The badge holder's zip lock seal works just like ziplock sandwich bags. With your choice of non-imprinted and custom imprinted. Custom Imprint - Small Minimum Quantity Required - At Low Cost ! 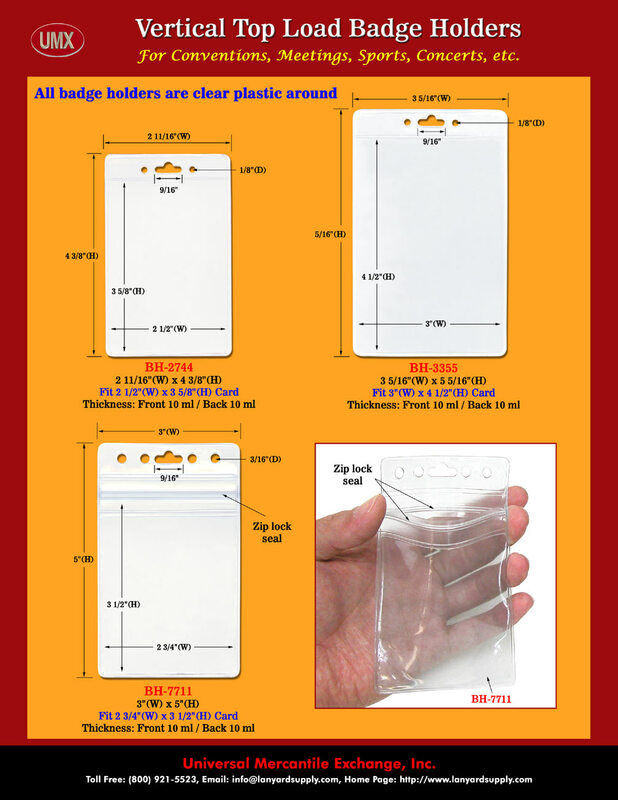 You are viewing Lanyards > Holders > Zip Lock Name Badge Holder or Zip Locked ID card Holder is one of The Most Popular Size of Vertical Holders For Name Badges and ID Cards.